The Gigablue Quad Plus design leaves nothing to be desired. Built-in 2 x DVB-S2 tuners enable an independent Twin usage. In addition, provide two additional tuner slots the possibility to extend the receiver with DVB-C2 and DVB-T/2. The powerful processor provides the viewer with a high-resolution imagery and a never experienced fast switching time. 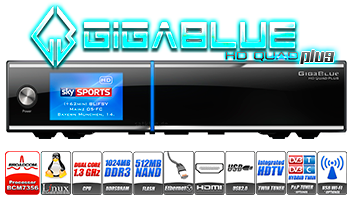 Another special feature of the GIGABLUE QUAD Plus is the link of TV and Internet. Record up to 4 HDTV broadcasts and watch another HD broadcast.